Judging from the response to Once Upon a Thread: Chapter 3, I think we all need to get started on our projects! It makes me happy that so many of you are playing along and feel inspired (even while you're reading those bedtime stories to your little ones!) Fun. Can't wait to see what everyone comes up with. Remember you can always add your projects to the OUT Flickr group. 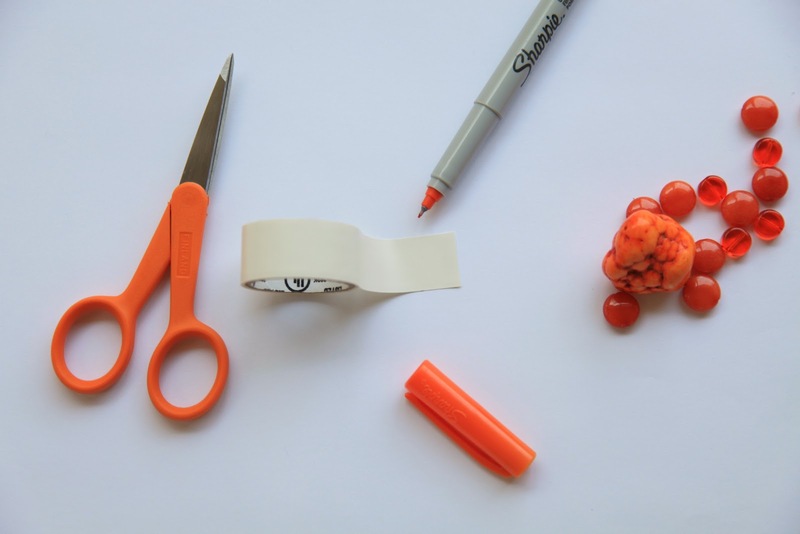 Meanwhile, it's been far too long since I've shared a Never Enough Orange project with you. My NEO Sewing Studio has been in such disarray lately, that I'm trying to get it all organized so I can actually use it without spending more time clearing away things and looking for supplies than I do sewing. I thought I'd share some of my storage solutions and would love to hear about yours. 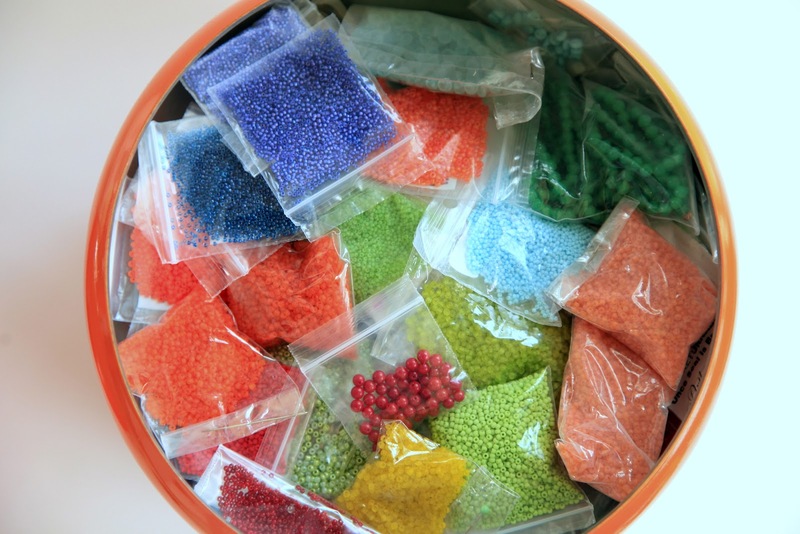 ➀ Beads: Instead of looking in my usual places at the usual "storage" solutions, I browsed places like etsy and ebay. I found this on ebay, a vintage flour canister. I removed the labels (but saved them for templates) and with a little "pumpkin" spray paint, I painted the yellow canisters a lighter orange to keep the alternating pattern. For the labels, I used some white electrical tape (found most anywhere) cut in the same shape/size and wrote on it with a permanent marker. Voila. I like that it's not only functional, but it's fun to look at, sitting on my table, and as I'm normally a form over function kinda girl, this is like a cherry on top since it's both. At first I thought they might be too small for my beads, but I have found they are shallow enough that it doesn't take too much digging to find what I'm looking for. ➁ Patterns: With a line-up of 5 girls, I have the chance of using the same commercial patterns multiple times. Often times I will trace out the size I want to use so I can use the pattern again for another size. I also like to use Japanese patterns that requires tracing since the printed pieces are overlapping on the sheets. These patterns were NOT organized well. I would usually end up tracing it again because I didn't label them well or the smaller pieces got lost. 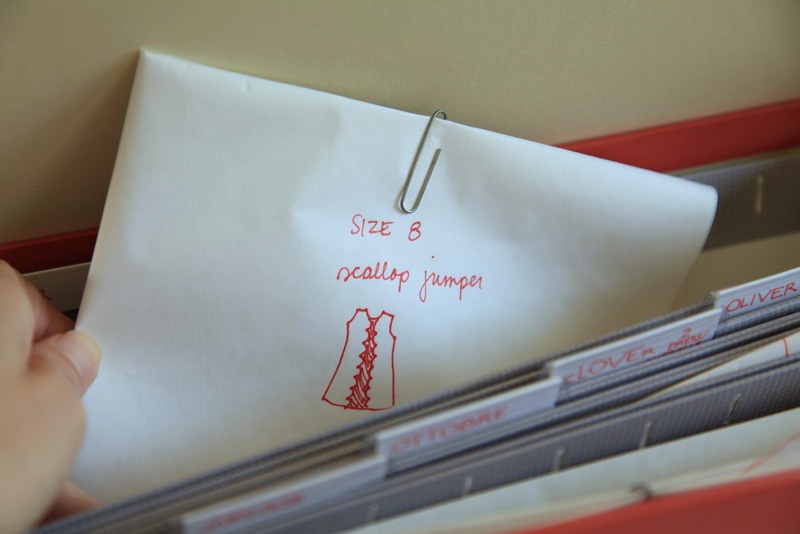 I found a hanging file box (orange, of course) and have started to re-organize my hand drawn patterns. I label each piece: what it is (front placket, neck bias, etc), the size, and (if applicable) what book/magazine it's from. I fold all the pieces and clip them with a paper clip and draw on the front what it looks like. In they go, all neat and tidy! ➂ Buttons: a friend sent me a link to this beauty on etsy and I was smitten. You might know by now my button obsession (the other b.o. ;). I love to browse ebay for glass buttons and there is such a beautiful array online that it is really depressing to go to a regular fabric store and see the plastic cat buttons glaring at you and the rest of the dull collection. It might be a sickness of mine, but at least it's an awfully charming one. I knew exactly what I wanted to use it for when I saw that it had little dividers inside each drawer. I like that the drawers come out easily enough that I can take the whole thing out to really decide what lovely button will be adorning my current project. If you don't want to spend a lot of time looking for something used and just right, the tiny Bisley drawers are perfect for small items like buttons, beads, and thread. They even have inserts you can buy, depending on how you want to divide things up. And they come in some very fun colors, even orange! 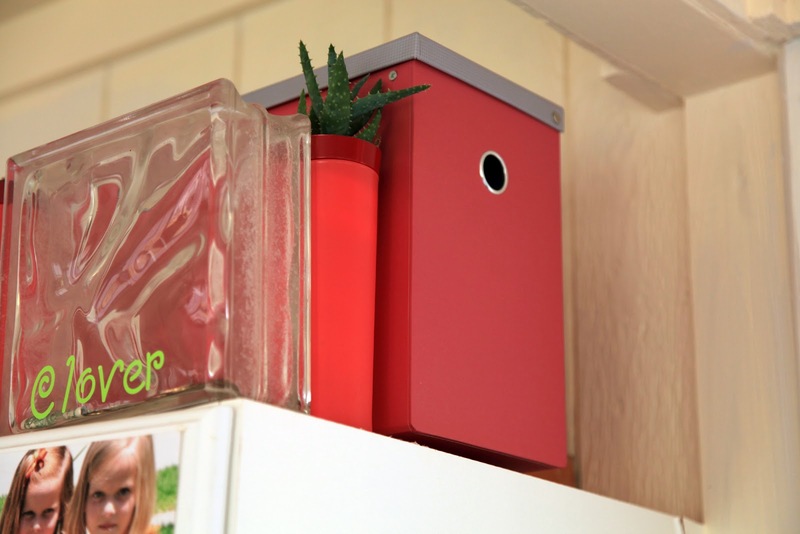 What are your creative Storage Solutions? Speaking of getting organized, I have my behind the scenes helper doing some tidying up around here. Did you notice my recipes tab all organized and my fancy new address? I feel very official, which is sometimes a very nice thing to feel! Great minds think alike! 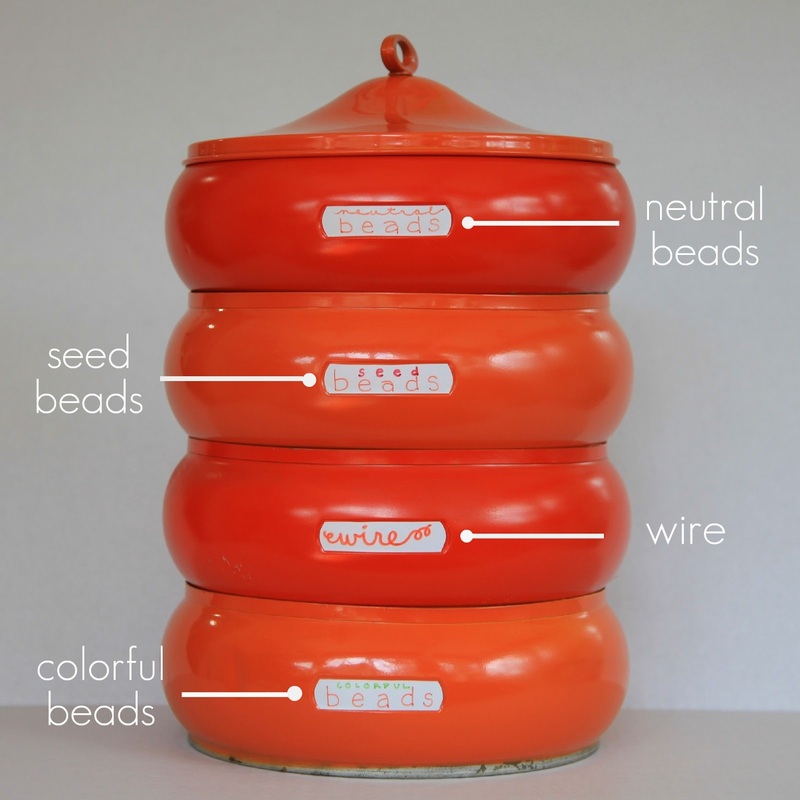 Last summer I found one of those vintage flour canisters at a garage sale I stopped at... looks pretty much the same, but mine was already all orange. 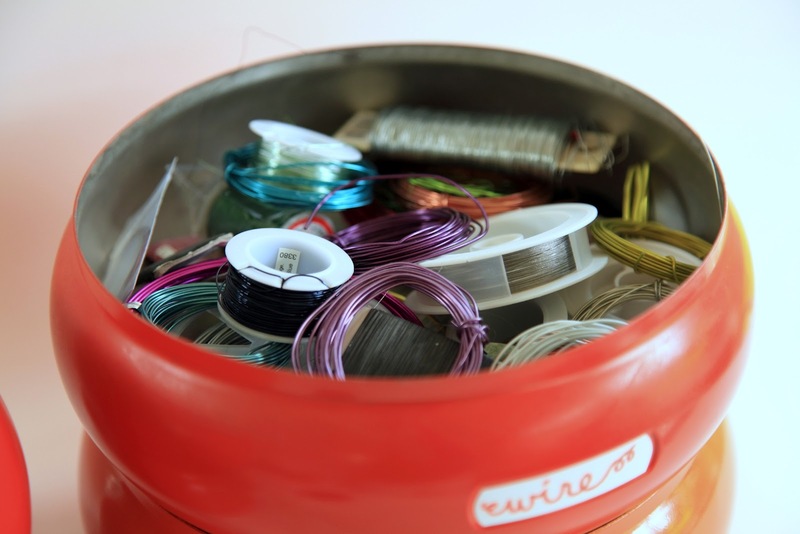 I have it sitting next to my sewing machine and it holds buttons, embroidery floss, etc. I felt like I hit the jackpot when I found it for $5! such awesome ideas!! Love them. I have a new sewing space that my lovely husband put together for me - used a combination of a media cabinet thing from Ikea (with open shelves in the middle and glass doors on either side), and then we used kitchen cabinets above (also ikea) with glass doors where all of my fabric is stored on mini bolts. I actually really love it....but I do get caught with the little stuff for sure. I love the flour canister idea - so cute and practical. I have a deeper one that used to belong to my grandma that I store knitting needles in. My other trick is I have a line of three small painted flower pots on my desk that have a bunch of the small stuff in them that I need all the time - bobbins, machine needles, tape measures, etc. 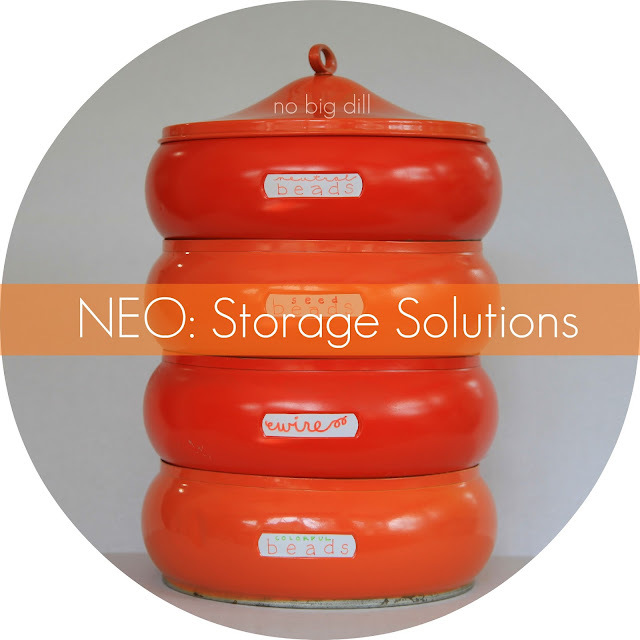 Why do I get so excited about storage solutions?? I have got to get out more ;). Oh...the button drawers are my favorite. Love it. I have a vintage mixing bowl on the corner of my cutting table to throw the scraps in while I work. That helps control chaos a little. I'm also disciplined to use ONE sketch book at a time, because the tiny scraps of paper overwhelm and frustrate me. When I get an idea, I force myself to go get THE sketchbook. Lastly, I made a cute fabric cover for a tiny olive can and lined the inside with felt. It is my "bobbin holder" that sits next to my machine during projects such as quilts that require several bobbins wound with one color. Love when you share your studio with us!! OOOHHHHH i love all your organized orange :) i love your bead storage and i especially love how you organized your patterns. I need to do that!! great tip!! Deb--oh, you lucky, lucky girl! That was a STEAL! Is yours alternating shades, or all the same? Pintucks-even better that it came from your grandma! I opened my email this morning and found an email from Pier 1 or Crate and Barrel (now I can't even remember I was so distracted by the images in the email). Everything was orange! I immediately thought of you and your NEO only to find out you posted an update!! Much love to your and yours. Please can you come to my craft room and whip me into some kind of organizational submission! I love how you've organized your paper patterns! Oh lovely! I believe you have a keen eye for all things beautiful. I think I need to revamp my pattern storage to look more like yours. Right now, mine is shoved into clear binder sleeves by type and it's kind of an organized mess! 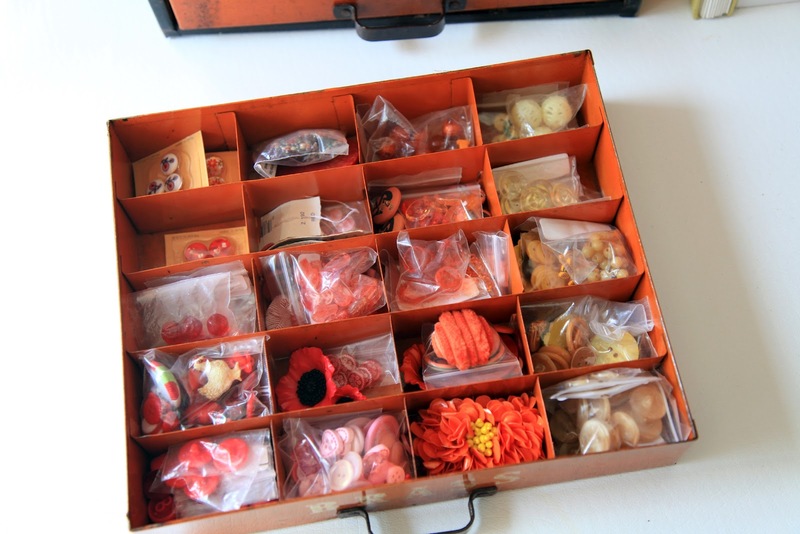 I have an orange love here too - now I have button storage envy, I keep mine in a tin, while it's fun to rake through I would love something like your drawers. I have GOT to organize my patterns! Thanks for the inspiration and hopefully it will turn into motivation to get the job done! I have a pattern problem. Like I have several dozen... or maybe more than a hundred... and I hate to throw them away! I also have a great deal of edited or drafted pieces and they never fit back in those bitty envelopes. A few years ago I cleared out a couple of drawers in a filing cabinet and took those over for patterns. I took the envelopes and organized them in plastic pages in a large three ring binder. Inside the drawers the patterns are organized first by brand, then by number. Now when I'm wanting to browse my patterns instead of wallowing through boxes of tissue scraps I flip through my notebook. 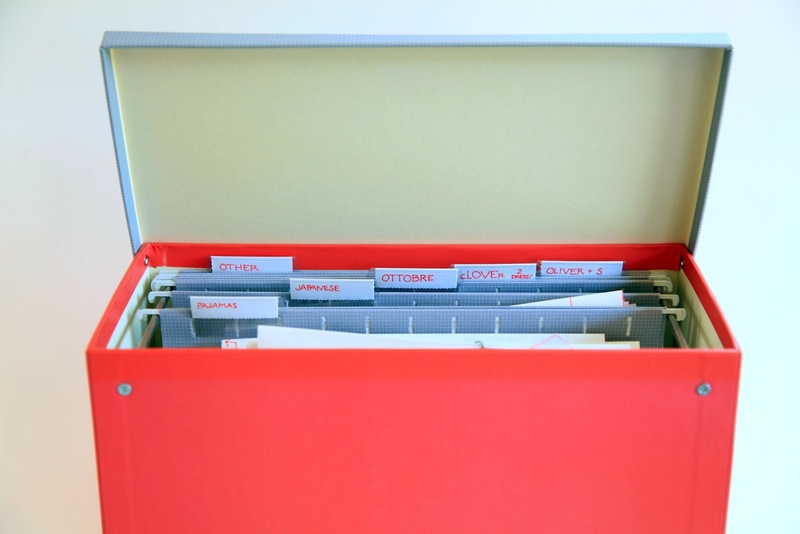 When I find what I want I can pull open the right drawer and find the file folder labeled with the brand, number, and size/s, just like at the fabric store! This has also made me much better at putting away those random scraps like elastic or button guides because it's as simple as opening up a file folder and dropping it in instead of shimmying a bunch of fragments out of an envelope, adding another shred, and trying to shimmy it back in without tearing anything! 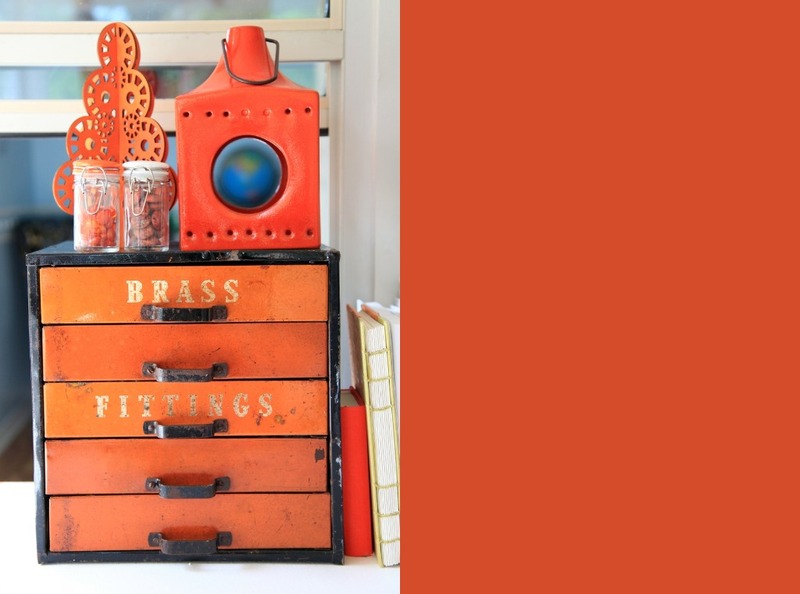 i love seeing how you have 'organazized' - the way my kids say it :) - your items...and in orange no less. my favorite color! 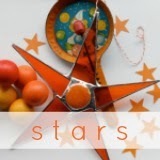 thank you for sharing your great ideas..love reading your blog. I find your organizing and decorating so inspiring! Thanks for sharing it with us. 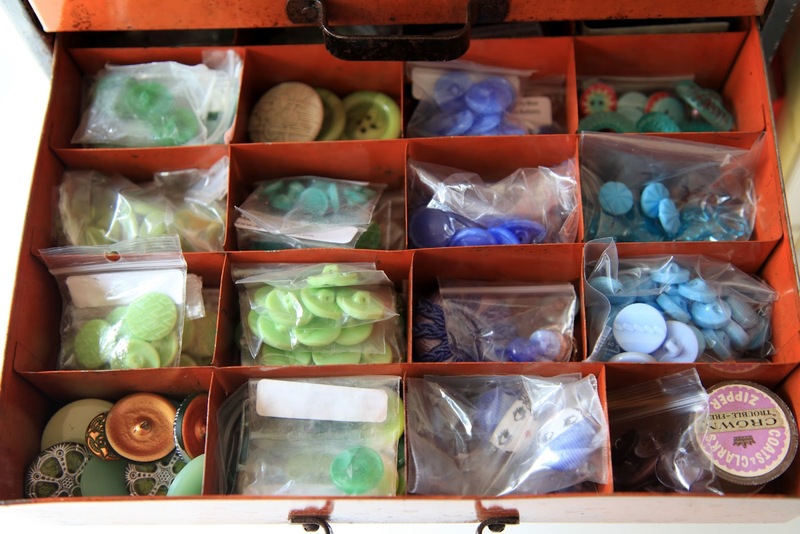 Your button drawer is pretty awesome. I like that you can reach what you need easily. I used to store my buttons in jars with pretty painted lids. Sorted by color. But I had to pour them out every time I needed something. I now use what looks like Chinese take out dishes. I just pop off the lid and can sort easily without having to pour. The lids are clear so often I can just "see" what I need before opening. They stack nicely on the shelves and are neat and clean! Having more patterns than should be legal, I actually bought two vintage pattern cabinets. The lateral style file cabinets with the company name printed across the front! Since I make costumes, my patterns are grouped by clothing era. I use gallon zip locks folded over if necessary to hold over sized and traced pieces. What used to be a very time consuming adventure, finding patterns, now takes moments. I am one happy camper about it. LOVE your vintage flour canisters. They are just so pretty to look at. Many options for something like that! You have a great eye! I have vintage canisters, too, but keep them original for stage props. I hung tags with embroidery floss taped on the inside and hanging out the lid so the finish wouldn't be damaged if I needed them for stage. I love your ideas, especially those drawers for all your sweet buttons. And I love that you're sticking with the orange. In my craft room it's all purple, inspired by your idea! And I love it. :) The best thing I ever did in my room was to hang my rotary cutting mat and ruler on the wall. I saw it on another blog somewhere, and thought, "Wow that's genius! I need to get my husband to drill some holes in my mat!" And then on further examination of my mats, the holes were already there! I felt really cool that day. ha! Now my mats aren't constantly falling flat on the ground, and they look kind of cool to look at too! My eureka moment was when I worked out the best way to store all my home made bias tape was on large wooden reels. Even better was that I managed to find a UK seller pricing them at £1 each rather than £3-£5 on the fashionable sites. I now have them strung across the underside of a shelf making them attractive, accessible and tidy! (I also had fun with my cotton reels). "Deb--oh, you lucky, lucky girl! That was a STEAL! Is yours alternating shades, or all the same?" Oh I so relate to you about orange ! What a bright and sunny colour ! Great tips, thanks Katy ! Can I just shout out a THANK YOU to you? Honestly I've have been trying to figure out for the last year or so how to organize my patterns in a way that I can access them easily but not use up too much space (I have a tiny alcove for a sewing room). Your idea is perfect! I can hardly wait to find the perfect hanging file for my area. Your idea for the buttons is also fab! Will have to scout out some options for that as well! I love it when you can find ways to organize that are both functional but beautiful!